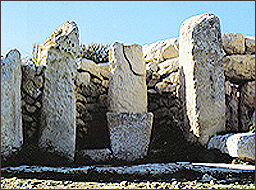 Tarxien – c. 3000-2500 BC was the height of the temple-building phase. 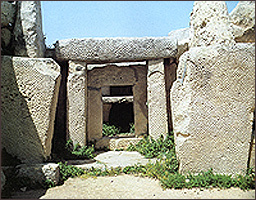 Several temples were constructed including Hagar Qim, Mnajdra, Borg in-Nadur, Tas-Silg and Tarxien. 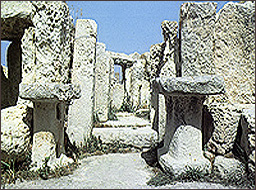 Construction had become very sophisticated, such as the immense stone blocks and the intricate facades of Hagar Qim. 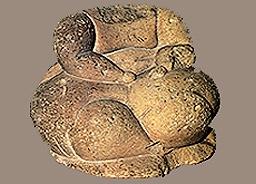 Hagar Qim was excavated at the beginning of the nineteenth century and has produced many 'fat figure' statuettes including the naturalistic 'Venus of Malta'. On the outer side of the north flank of Hagar Qim a open-air shrine has been inserted into the wall, whose facade combines the suggestive symbols of the male and female generative organs. 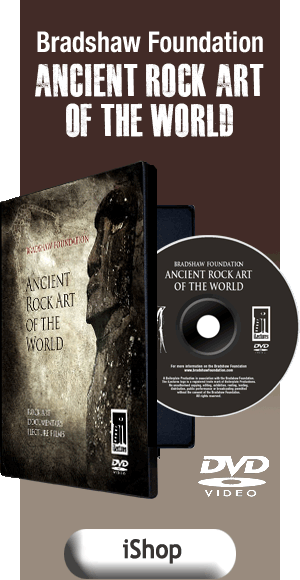 There is also the unique four-sided altar. Various facades of the temple have been interpreted as symbolically depicting male and female reproductive organs. Construction employs ‘corbelling’ or oversailing of the walls in order to narrow the span of the roof. 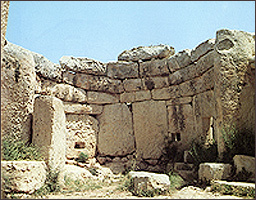 At the Mnajdra temple complex 1000 metres away, ‘corbelling’ is also demonstated. There also appears to be astrological alignment – with equinoxal sunrises. 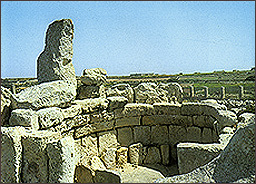 All the temples, including Tas-Silg and Borg in-Nadur, retained their religious function during the successive Maltese ages.